We report on the design, implementation, and use of C Wolf, a toolset which extracts finite labeled transition systems from C programs. The extraction process is guided by user input on how a program should be abstracted, and what events should be made observable to the user. The output is an abstracted model suitable for input to the Concurrency Workbench. Additionally, facilities are provided to carry out simple observational equivalence-preserving transformations which reduce the size of the generated model. Finally, we report our experiences in using the toolset to analyze the GNU i-protocol(V ersion 1.04) and the BSD ftp daemon (Version 0.3.3). 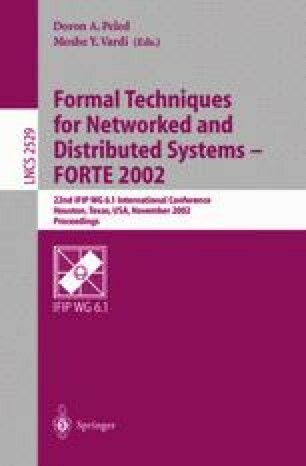 Abstract Model checking C programs Concurrency Workbench FDT for network protocols Verification and validation Software tools. Eleftherios Koutsofios. Drawing graphs with dot. Technicalrep ort, AT&T Bell Laboratories, Murray Hill, NJ, USA, November 1996. This report, and the program, is included in the graphviz package, available for non-commercial use at URL http://www.research.att.com/sw/tools/graphviz/. David Ladd, Satish Chandra, Michael Siff, Nevin Heintze, Dino Oliva, and Dave MacQueen. Ckit: A front end for c in sml, March 2000. Available from URLhttp://cm.bell-labs.com/cm/cs/what/smlnj/doc/ckit/index.html.